Students who decide to get involved with the Eastern community on a more active level will find that a number of opportunities are just waiting to be experienced. The opportunities made available outside of the classroom can only add to this experience. Some will allow them to play a role in the shaping of Eastern's future. These opportunities will help to develop existing skills, meet new people and help build your future resumes. The opportunities below await you! Many of the positions listed here will be posted on eRezLife when openings become available. Computer Assistants - Network Assistants and the Network Computer Coordinator aid members of the on-campus residential community with the Ethernet connections in their rooms/apartments, with the Network Computer Coordinator handling the more difficult work orders. Additionally, the Network Computer Coordinator has the added duties of hiring and supervising the Network Assistants, and, if necessary, Lab Assistants. To apply or find more information about this position, click here. Conference Assistants - (summer positions only) - (May - August) Conference Assistants act as ambassadors to the campus for thousands of guests who travel to Charleston each summer. The position has a wide variety of responsibilities including working the front desk, night security, greeting at dining service, maintaining the linen program, and recruiting future EIU students. More information is available from the Camps and Conferences Office in Lawson Hall or by phoning 217-581-7482. To apply or find more information about this position, click here. Desk Assistant - Desk assistants are representatives for the hall in which they reside and act as the “face” of EIU Res Life. This customer-oriented positions’ duties include answering phones, data input, computer inquiry, mail forwarding, filing, and, most often, assisting residents and guests at the reception counter. As positions open, applications will be made available on the hall’s webpage. To apply or find more about this position, click here. 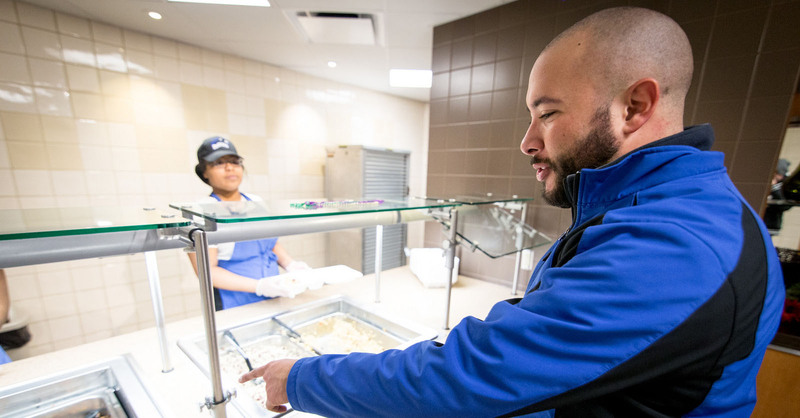 Dining Services - Panther Dining offers a variety of student worker positions within the University Food Court, Marketplace Convenience Centers, Panther Catering, or any of the three residential dining centers located in the residential halls. Duties typically include bussing, dish washing, serving, food prep, register transactions, and stocking inventory. Applications are available from the Dining Services Assistant Directors, the individual units, or online. To apply or find more about this position, click here. Night Assistants - The Night Assistant program works closely with the University Police Department to provide top-notch security for students and university property. Night Assistants have a number of duties with their primary function being to act as the eyes and ears of the University Police Department. To apply or find more information about this position, click here. Resident Assistants - (August - May) Resident Assistants (RAs) are student peer leaders responsible for developing cohesive learning communities in university housing. The RA position provides real-life experiences in student affairs, conflict resolution, team building, administrative tasks, and more. The position is a premiere leadership experience and one of the most challenging and fulfilling student leadership opportunities at EIU. RA positions are filled each spring and have a more stringent and unique timeline than other on-campus positions. To apply or find more information about this position, click here. Senior Staff Assistants - (August - May) Senior Staff Assistants (SSAs) are an integral part of the res. life community within Greek Court and select residence halls. As EIU Housing staff members, their primary responsibility is to provide support to the director(s) of their building(s) and to ensure residents’ needs (academic, social, etc.) are fulfilled in the best possible manner. Before applying, Senior Staff Assistants usually have RA or Greek experience, depending on the position. To apply or find more information about this position, click here - residence halls or here - Greek Court. Student Custodian - (academic year only) Every hall employs one or two residents to work with the Building Service Worker (BSW) staff. These students assist with various duties like emptying trash cans, sweeping common areas, cleaning glass doors and windows, and vacuuming common area rugs and carpeting. To apply or find more information about this position, click here.